I went to Copeland's with a friend a while back and we ordered the Hot Crab Claws for our appetizer. I never had them before and boy, I really missed out all these years! They were divine! Doing what I always do when I find a new dish I love, I picked through it figure out what was in it. That evening I looked on the internet and I found Copeland's recipe! It's so easy to make and if you buy enough claws, you can make a meal off this with a nice salad to go with it. 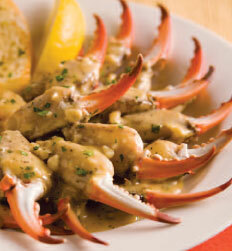 If you can't find crab claws, they can be substituted with crawfish or shrimp. Enjoy! Place seasoning, herbs, garlic and half the butter in a preheated skillet; saute until butter is melted. Add seafood, chicken stock and Italian dressing; increase heat to high and toss until seafood is cooked through. Add remaining butter; swirl into the sauce. Do not boil. Serve immediately with buttered and toasted French Bread slices. Wow ! what an nice blog.Thanks for sharing this information.Your information is really informative for us. Thank you, jyoti. I was about to abandon the blog due to lack of followers,etc. but your post gave me inspiration to continue. I hope you will come back often. An impressive share! I've just forwarded this onto a coworker who was doing a little homework on this. And he actually ordered me dinner simply because I discovered it for him... lol. So allow me to reword this.... Thank YOU for the meal!! But yeah, thanx for spending some time to talk about this subject here on your website. Yes! I lived in new orleans for college about 7 yrs ago and I've been craving these ever since I moved back to Chicago! Thank you, making these tonight! These are my favorite crab claws! what brand of cajun seasoning do you use? I made it with Tony Chachere's and it came out way too salty.